Clipped from the National Enquirer in the summer of 1978. 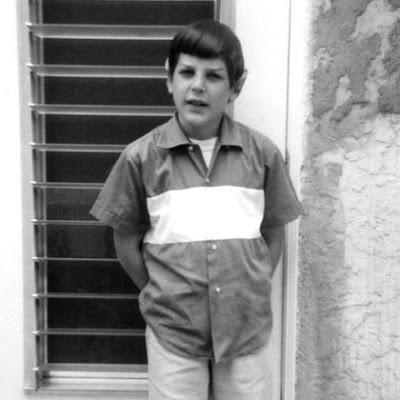 Considering Adam's resemblance, it's too bad he never played a younger Spock in a flashback or time-travel story! But, I'm sure he didn't want to get typecast either, adding to his troubles as a celebrity offspring. But he could have at least been one of the actors playing Spock as he grew up rapidly in "The Search For Spock," easily. Adam has written a book about his experiences called "My Incredibly Wonderful, Miserable Life: An Anti-Memoir." The photo above, and the one directly below, come from the official site for the book. Thanks to these pictures, we now know what young Spock looked like a a child, during the events in the animated episode. "Yesteryear." Also, too bad they never used him in the original series! How great would that have been, had there been more seasons? A live-action version of "Yesteryear," featuring Adam as the young Spock, with Mark Lenard and Jane Wyatt reprising their roles as Sarek and Amanda, would have been awesome. Yes, there was a missed opportunity there for sure, as far as we fans were concerned. 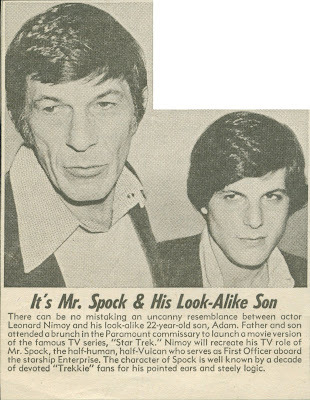 Heck, even a guest-star appearance in one of the spin-off shows as Spock's son whom we never saw before. One can dream , can't one? 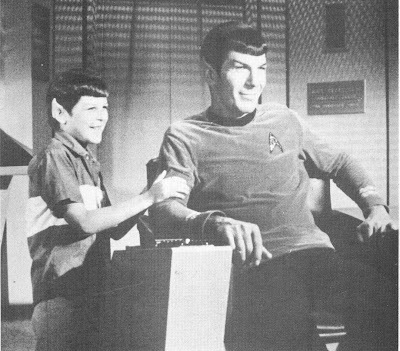 Above is the famous picture taken when the crew set up Nimoy during a scene to be surprised by Adam whom they had put in makeup! 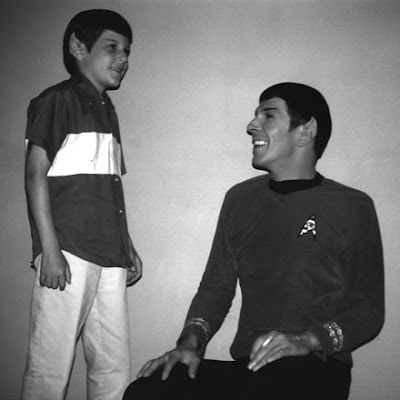 You know I feel bad, because I never really thought about Spock, I mean Leonard having children. I see what you mean though how cool would it have been to have his son working with him in a classic episode, man they could of had him and the original girl pose together for the photo in the original Amok Time episode! Speaking of that girl, I'm surprised she hasn't shown up at some convention, making appearances and selling autographs as "Young T'Pring In Photo." Actually, the woman who played young T'Pring as a child *does* make some appearances at conventions. She's one of my friend on MySpace and I have traded a few e-mails with her. She's a very pleasant lady, very nice, married with a good-sized family, living out west somewhere I think. I believe she sometimes appears at cons with Arlene Martel, so you get young T'Pring and grown-up T'Pring at the same show. Thanks for the info! I got it right, didn't I? So I can't say I'm surprised. I have a Cracked spoof on ST fandom which I am going to post soon, that has the janitor that cleaned the ST stages making an appearance to screaming fans. Funny, but almost true! I wonder now if one day there will be a lineup at a future convention with all the bit players that played Spock at various life points as we have seen in the movies. There would be a dozen of them! Adam Nimoy had an amazing TV directing career going for many years. He directed everything from sci-fi shows like Star Trek: TNG and Sliders, to dramas such as The Practice and NYPD Blue. Too bad about his problems with addiction. I had no idea about that. It's interesting that Leonerd Nimoy has mentioned in many interviews that he had a problem with alcohol abuse for years too. Hope Adam can continue to stay sober and maybe even return to directing. You're right, I had forgotten about reading that fact about directing TNG back then! Thanks for the reminder info! Thanks for adding my blog to your list of links. I've been a follower of My Star Trek Scrapbook for some time now. Cheers!